Okabe A, Hiramatsu R, Umehara T, Fujita Y and *Shimada M.
The expression and roles of semaphorin type 3C in granulosa cells during the luteinization process. *Nakagawa S, Shimada M, Yanaka K, Mito M, Arai T, Takahashi E, Fujita Y, Fujimori T, Standaert L, Marine JC and Hirose T.
The lncRNA Neat1 is required for corpus luteum formation and the establishment of pregnancy in a subpopulation of mice. Kawashima I, Umehara T, Noma N, Kawai T, Shitanaka M, Richards JS and *Shimada M.
Targeted disruption of Nrg1 in granulosa cells alters the temporal progression of oocyte maturation. 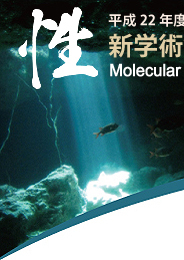 Yamashita Y, Okamoto M, Ikeda M, Okamoto A, Sakai M, Gunji Y, Nishimura R, Hishinuma M and *Shimada M.
Protein kinase C (PKC) increases TACE/ADAM17 enzyme activity in porcine ovarian somatic cells, which is essential for granulosa cell luteinization and oocyte maturation. *Yazawa T, Kawabe S, Kanno M, Mizutani T, Imamichi Y, Ju Y, Matsumura T, Yamazaki Y, Usami Y, Kuribayashi M, Shimada M, Kitano T, Umezawa A and Miyamoto K.
Androgen/androgen receptor pathway regulates expression of the genes for cyclooxygenase-2 and amphiregulin in periovulatory granulosa cells. *Shimada M, Mihara T, Kawashima I and Okazaki T.
Anti-bacterial factors secreted from cumulus cells of ovulated COCs enhance sperm capacitation during in vitro fertilization.